A groundbreaking discovery involving a harmless virus could help the millions of people suffering hearing loss. 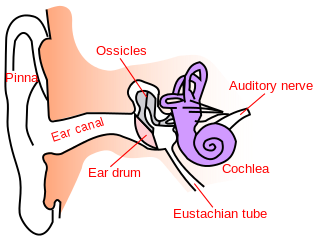 The machinery of the inner ear is difficult to study. Scientists do not know much about how the inner ear works because it is guarded by one of the hardest bones in the body. This makes it challenging for scientists to isolate without the inner ear damaging it. However, scientists do know the path that sound waves take upon entering the ear canal. Here, they cause the eardrum to vibrate. These vibrations are then transferred by three small bones into the cochlea, the auditory portion of the inner ear, where thousands of sensory receptors vibrate the inner and outer ear hairs. The cochlea also open channels permitting the flow of neurotransmitters. This process triggers electrical waves that send information to the brain to be processed and decoded. Based on what is known about the inner ear, scientists have developed two treatments for hearing loss: hearing aids and cochlear implants. Hearing aids are designed to amplify sounds, while cochlear implants are designed to change sound waves into electrical waves that the brain can decode. However, neither of these solutions fix the underlying cause of hearing loss. While both are beneficial, it is difficult for people who have either of these devices to distinguish the subtle variations in voices and music. In 2003, researchers discovered that specific genes could change the cells in the inner ear to regrow damaged hair cells, which capture sound vibrations. In fact, it was discovered that if these genes, called Atoh1, were mixed with a genetically engineered harmless adenovirus, they could be used to improve hearing. In 2013, Atoh1 was tested for the first time on mice. The gene was first injected into a harmless virus and then into the cochlea of the mice whose hair cells were nearly destroyed. The results were surprising: just two months later, the subjects’ hearing had improved by 20 decibels. This is comparable to the difference between listening with hands over the ears versus uncovering them. Lead researcher Hinrich Staecker and his team at the University of Kansas Medical Center intend to expand this research to humans who suffer from hearing loss. Trials will start at the University of Kansas and then expand to other institutions. The first trial will involve 45 volunteers who will be injected, like the mice, with the viral gene directly into their cochleas. After peeling the ear drum back, scientists will insert a needle containing the virus into a small laser-made hole to reach the scala media where hair growth occurs. This procedure is relatively safe. “The biggest risk is that we interfere with residual hearing, so we’re starting with people who have lost almost all hearing already,” said Lloyd Klickstein, head of translational medicine at Novartis. The virus is restricted to the injection site and is not likely to recombine with the subject’s DNA. Unfortunately, individuals who are born deaf will not be able to participate in the trials because they typically lack the hair cells needed to support the virus. However, these trials offer high hopes for those with hearing loss. Estimated to help one to two percent of people who suffer from severe hearing loss in the United States, or approximately seven million people, the treatment will likely make its way into the clinics within the next decade.